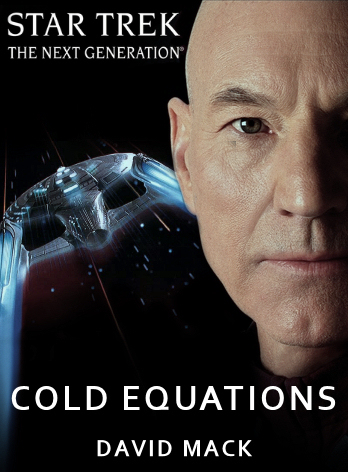 Unlike the Star Trek Destiny trilogy, which was one epic story split across three volumes, Cold Equations will comprise three separate novels that are set during a brief span of time (a few months), and share a cast of characters, a number of themes, and some narrative subplots. ...each of the three stories hinges on a moment in which one or more characters must make terrible moral or ethical choices, weighing the cost of one life, or a few lives, against those of many more, or deciding how much — and who — they are willing to sacrifice for the sake of victory. Book One of the trilogy, which is written and now with the editor, is The Persistence of Memory, and it will put the Enterprise crew at the forefront of an effort to stop the Typhon Pact from exploiting stolen Soong-type android technology as a weapon of war. In Book Two, Silent Weapons, Captain Picard and his crew must protect Federation President Nan Bacco when it becomes clear she has been targeted for assassination. However, in the course of their mission, the Enterprise crew discovers that there might be an even greater conspiracy lurking behind the assassination plot. In Book Three, The Body Electric, the Enterprise crew is brought to the center of the Milky Way by an old friend — Traveler and former shipmate Wesley Crusher — to try to stop a massive sentient machine whose mysterious labors threaten the future of every civilization in the galaxy. Sounds good to me! I wonder if any familiar Soong-types might make an appearance.